I have just returned from the Sonoma coast, where I was celebrating the birthday of my dear, almost 90-years-old friend, Dr. Annemarie Roeper. Annemarie is an amazing woman. She and her family fled Nazi Germany when she was 19, where she was a protege of Anna and Sigmund Freud. After arriving in America, she married her childhood sweetheart, raised three children and founded the Roeper School for Gifted Children (www.roeper.org) which is still a beacon for exceptional young people. Her groundbreaking work with children has made her an international celebrity in the world of gifted education. She continues to write, publish, and travel, as well as counsel gifted children and adults (www.roeperconsultation.com). Annemarie is a true inspiration to those around her. Everywhere she goes, children are drawn to her. She has the ability to make them feel as ease, to make them feel known. I have observed how they immediately begin telling her about their lives, their concerns, as if they are having an intimate conversation with an old and trusted friend. It's really quite extraordinary. 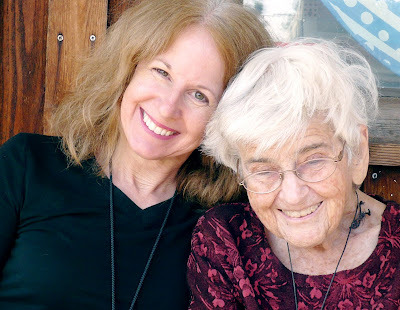 As she reflected recently on what it was like to be an elder in this society, she reminded me that although there are many things that are difficult about growing old, there are many things that simply don't change: our capacity for giving and receiving love being the one thing that continues to always become richer. "If there are two words that would express the wisdom I would like to share," she told me. "It would be this: 'Love Honestly'." Can you think of any better way to live one's life? What a wonderful expression... and I'm so glad to see a photo. I'd love for my children to meet her and have the gift of her impression/thoughts on their individual 'gifts.' Thanks for sharing! Oh, how I wish I could have been along on that journey... I miss you SO, my friend. What a wonderful post! Always so inspiring! !